Ahhh – Sunday evening tastings returneth, and only four days to Richard and Angie’s nuptials. And, symbolically, it was two wines this evening, both Riojas from the same 01 vintage. 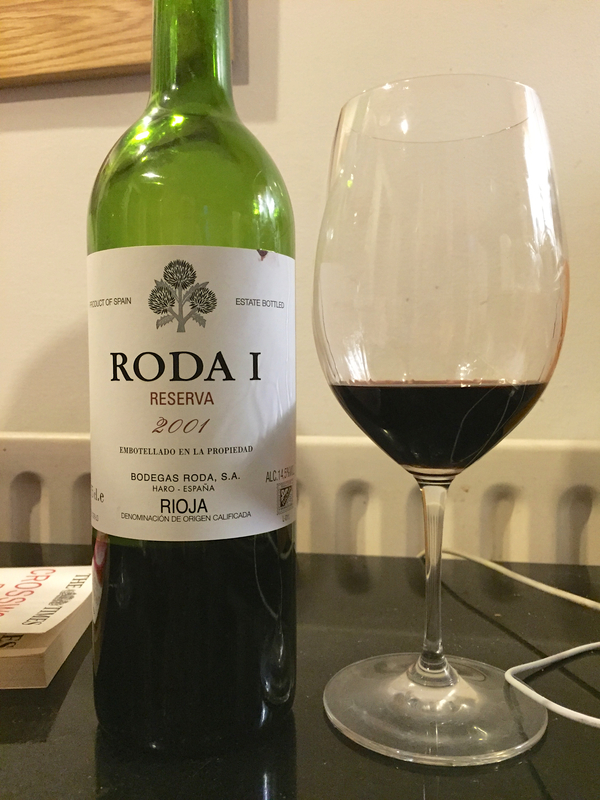 Firstly, Roda 1 Reserva (14.5%) made solely from Tempranillo. Dense black in colour with some viscosity this smelt vaguely of blackberries but it had quite a muted fruit nose. The taste was dry with sweet notes with a touch of tannin to give it structure (our notes). This can be compared to Anthony Rose’s notes, following a vineyard visit “Youthful ruby hue, still vigorous, lovely fragrant red fruits quality, seductively concentrated bright cherry and strawberry fruit with delicious purity and concentration, a touch of sweet chocolate, yet real elegance and freshness with oak integration bringing spicy top notes. Very complex with firm structure and fine lovely balance. Drink now and 5 – 8 years. 94”. We must be missing a trick! It was a well-made wine, not particularly complex and lacking the characteristics we would associate with a 13 year old Rioja. 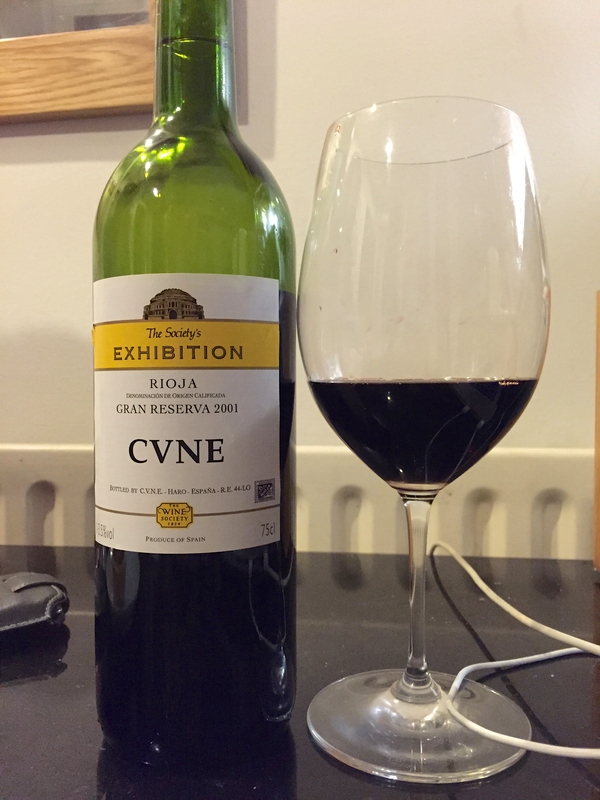 The second wine, the Wine Societies’ Exhibition Rioja from CVNE was a Grand Reserva at 13.5% ABV. This was ‘mostly Tempranillo’ with the addition of Graciano and Mazuelo. Almost black in colour with a still purply-red rim, this wine was much more interesting. Raspberry aromas on the nose heralded lovely acidity and leathery tastes that were very attractive. We thought the difference may have been that of a Gran Reserva vs. Reserva; the Roda was still too young; or the blend of grapes in the CVNE made it more interesting. I think the latter is the stronger argument. I drank a 100% Tempranillo from Valencia a few days previously and found it well-made but a bit monotone. Graciano is a real ‘lifting’ grape, adding so much to the Tempranillo which can be flat without it. The blogs will continue but best wishes Richard and Angie. I never get morning after headaches when drinking wine. I’ve only empirical evidence – no idea if the matter has been considered scientifically – for my belief that headaches are less likely if you drink good (here a synonym for more expensive), rather than poor (cheaper) wine. Better wine making, less corners cut, less reliance on chemicals. 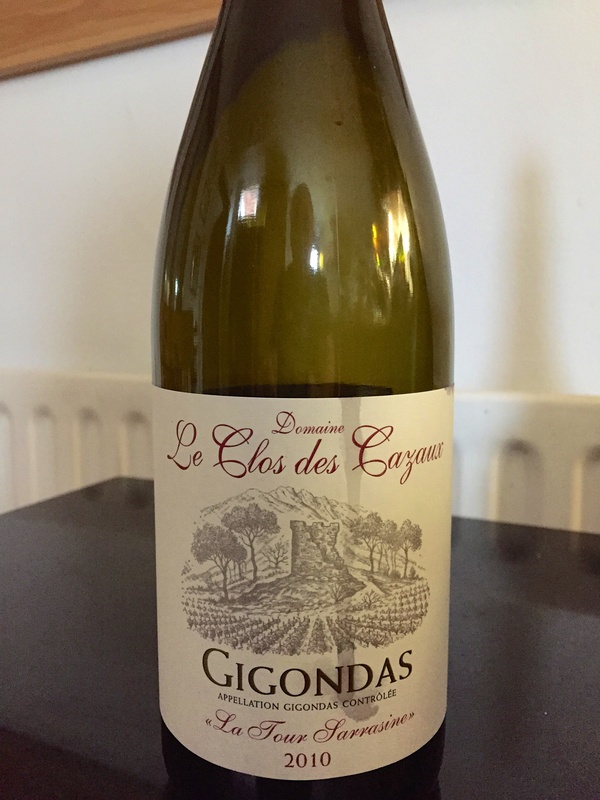 Anyway last night, not wishing to have another glass of the Gigondas and having some smoked salmon in the fridge, I opened a white. This was a present from Geoff, brought back from a holiday in the Loire in 2013. I’ll leave it to him to fill out the detail but the wine was Domaine de la Paleine Pamina 2011. Can’t see any UK stockists. Really lovely wine with spice, fruit, weight and mouthfeel beautifully combined. Just off-dry but not enough to put me off. A perfect match for the smoked salmon and also for some roquefort – not many wines could manage both. So, this morning – no headache, despite the wine being 15%. I recently opined how much I prefer the lighter style of Syrahs (amongst other) grape varieties. This obviously sent my partner in wine scurrying to his much vaunted cellar to dig out a sample I would call a ‘fruit bomb’. 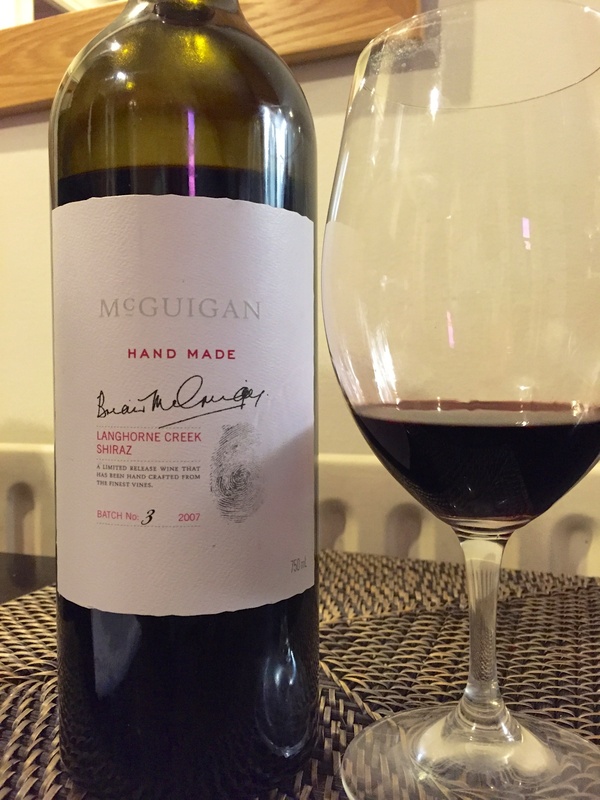 McGuigan’s Hand Made Batch 3 2007 Langhorne Creek hails from south-east of Adelaide, an area noted for ‘beefy reds’ and ‘very low rainfall’ (Stevenson). This cost £20 from Majestic Wines. Later vintages are widely available. The colour was almost black, the slight red tinge having a purple rim in the glass. There was an appealing smokiness to the nose in addition to the black pepper notes, typical of the grape. The fruit was more blackcurrant than anything else – and it was obvious. The palate had a luscious red-currant flavour and was very weighty with a long dry finish. But – and this is a big but for me – the sweetness was present, leaving a coating inside the mouth that, after three tastings I wanted to cleanse away. The finish was long. It has immediate appeal but, I wondered, how quickly would I tire of its insistence? Maybe it would suit a strong flavoured food – possibly barbecued (to be stereotypical) but I’m afraid it’s not a wine I will return to in a hurry. Richard may be able to comment on the second day. [Richard: another wine another wax capsule experience. Yes, this had one too. I hadn’t yet received the the advice from the WS (see previous post) but a few minutes hacking (and cursing) away with a sharp knife soon exposed the cork. This claims to be a ‘hand crafted, limited edition’ wine. A wine with pretensions it seems. The web site (slow to load and difficult to navigate) is silent on the number of bottles made and aren’t all wines ‘hand crafted’ to an extent? So, not disposed to like the wine, even before tasting. The maker claims 18 months in oak but Geoff doesn’t mention tannins and I couldn’t taste any either. No obvious ageing potential. Our views on the day 1 tasting were thus similar – too fruity, too sweet. Comments Off on Eating my words? Before trying this wine, we were commenting upon how many unusual grape varieties we had been trying recently. Maybe it’s the saturation of the senses that stimulates the search for something different and unusual. Often it can be a fruitless (pardon the pun) search but in this case it wasn’t. The Bical grape is a popular Portuguese variety of white grape that ripens early thereby avoiding the dampness that can lead to rotting of its thin skin. 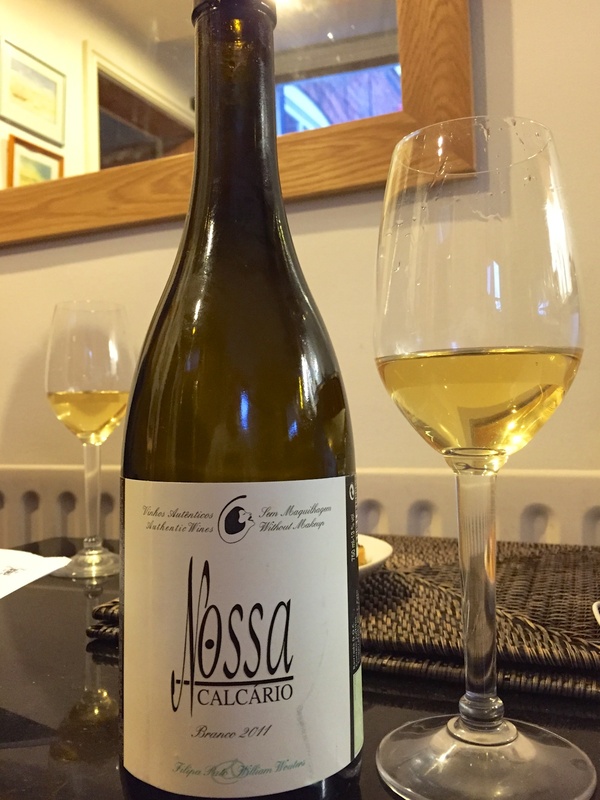 The wine we tried was Nossa Branco Filipa Pato 2011 (WS £19) and came a-topped with wax capsule, which Richard described as having ‘pretentions to ageing’. Bit harsh, I thought, especially after trying the wine. A deep lemon in colour, this was wonderfully bright and clear. The high acidity was easily detected on the nose which had some white pepper notes but was whistle-clean. It had the honeyed bouquet of a wine that was old and yet still attractive in its fresh acidity. The palate was big and long. The lemony acidity was still there but it had a lovely cooked lemon flavour rather than the more obvious acidity. This gave it depth and interest, as did the chalky tones. It was bone dry. Steven Spurrier said it had a ‘faintly honeyed’ intensity, which is echoed by Jancis Robinson, who declares it is faintly reminiscent of a Riesling. This is a very good wine; we’d gladly have another to try with a strong flavoured white meat dish. It would age well which, in my opinion, justifies the wax capsule. [Richard: I reviews this wine on the WS website and commented, adversely, on the wax capsule. Soon after I received an email from the buyer advising me that, when opening, I should ‘ignore the capsule’ and just drive the corkscrew through. This works if the capsule is soft but not if it has hardened. I’m still finding bits of wax in the kitchen. Most vins de garde are sold without a capsule. Indeed the whole rationale of ageing a wine is the slow movement of oxygen through the cork. (Geoff – is this right?) So I’m not sure what the purpose of the capsule was here, unless to convey some ‘gravitas’ or similar (see next post). Anyway, lovely wine, perhaps a bit expensive. There is a lot of information about food and wine matching. It’s not something I’ve taken much interest in with meat – red and fish – white about my level. But last night we had some calf liver and I had a look for potential matches. Given that there is really only one recipe for calf liver (the only food where this applies?) I though there would be some consensus on the wine. Not so, with pretty much every red grape mentioned as suitable, even beaujolais. So I thought I’d go with a ‘big’ red, partly to match the liver and also as a foil for the other essential ingredients, namely bacon and sage. (We also had grain mustard mash, roasted shallots and an oloroso based gravy). Coincidentally I’d been sorting out a cupboard and discovered a few wines I’d forgotten about. 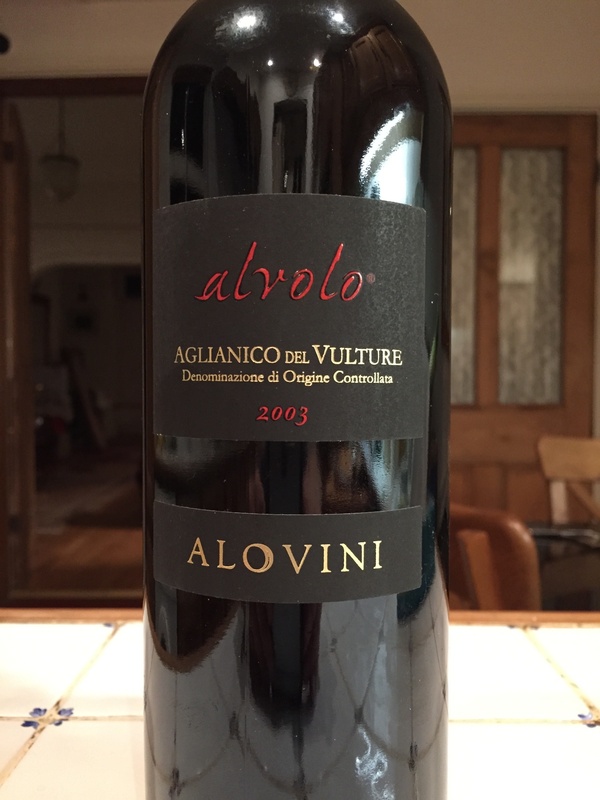 One of these was a 2003 Alvolo Aglianico del Vulture, made by Alovini in the south of Italy (14%). This was a good match as it turned out – lots a plummy fruit, perfumed, aged in oak but the tannin not predominating. A wine with some personality to counter the robust food. From the Wine Society, about £14 which is excellent value. Out of stock, as is a similar 2008 by the same maker. 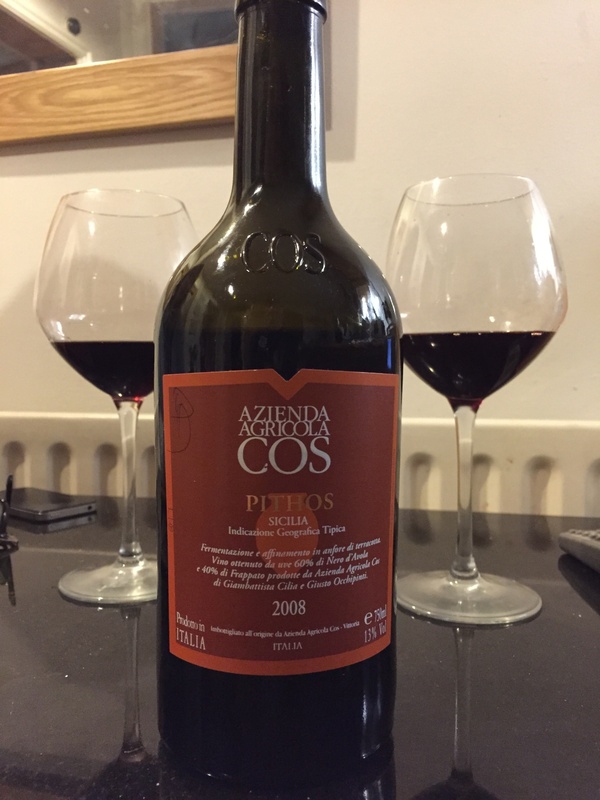 We also tried another one from the cupboard – Azienda Agricola Cos Pithos 2008, made in Sicily (13%). This is a blend of two grapes I know little about, Nero d’Avola and Frappato. Also WS but no longer stocked. Apparently the wine is matured in amphorae and is low sulphur. It could be considered a ‘natural wine’, something I’ve never knowingly tasted before. Comes in a stumpy bottle. Another lovely wine, lighter and with more acidity, lots of fresh fruit flavours and a long finish. I’ve passed the remainder on to Geoff for a comment. (Geoff – I appreciated this offering left outside my front door; used to be milk that was left there but this is more exciting. A day on and the wine had developed a real farmyard palate. As the Frappato is not considered a ‘long-liver’ whilst the Nero d’Avola is, I guess the former grape had partly oxidised leaving a full-bodied wine with a very savoury tang. It was not unpleasant but certainly distinctive. An acquired taste, you might say, and one that would suit richly flavoured foods. I host weekly wine tastings in Birmingham. These are good fun both for me, and, I hope, the attendees. As part of the evening’s format, the customers vote for their favourite wines from the selection tasted and this blog is a thought on a style of red wine that seems ‘hit the spot’ with most customers – and male customers particularly. I’m referring to the full bodied and high alcohol reds, as manifested in Primitivo (AKA Zinfandel), Shiraz, Pinotage and Valpolicella – Ripasso or Amarone styles. I am sure there are others, but you get the idea. It’s not that I deny that customers can vote them as their favourite wines but I am aiming the question back at myself. Why can’t I appreciate them? Likewise, why can’t I appreciate a good malt whisky, different gins, refined tea flavours or distinctive beers. Is it just a matter of taste or is there more going on? I think I have a good palate and appreciate the effects of flavour combinations. However, I believe there is a mental side to this as well. Rather like a Shakespeare play, the more you learn, the more you appreciate, therefore it’s not just the senses but also the mind that is involved in the process. There is not such a thing as pure aesthetics. The extension to this argument is that we can be conditioned – or condition ourselves – to appreciate, or not appreciate, something. Or, even worse, to be bothered to appreciate something or not. This can be experienced at tastings when group appreciation occurs. Someone says they like something or can detect something and there are noddings of heads. Suddenly, everyone appreciates it. So, to return to those heavier reds, so liked by my customers. How far have I set my mind against their perceived powerful black fruit flavours, the unrefined jamminess and the dollop of sweetness at the finish? Maybe it’s not just a matter of taste, after all. You may remember, from a few years ago, the ‘ABC’ movement, in other words a revolt against the seeming ubiquitous grape, a shortening of ‘anything but chardonnay’. I always thought that the familiarity of the initial letters made this more appealing than it’s effect in reality, and it was only ever intended as a protest against the ‘tropical fruit’ New World styles which then were seen at every dinner table, pub and wine bar. I doubt that it had much effect on the sales of white burgundy. 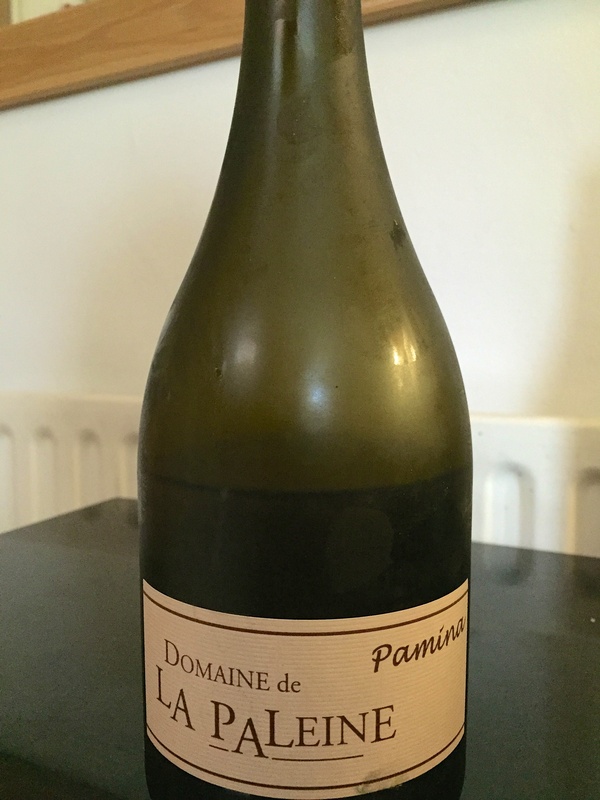 Anyway, thinking about this post – another solo effort as Geoff is busy on Friday nights for a while – it occurred to me that we had never blogged on a sauvignon blanc. Actually we have – here and here, but the wines did not stick in the memory. However in the second link you will find the perceptive words ‘sauvignon is everywhere’. Yes, times have changed and sauvignon is the new chardonnay. There is now a wide range from cheap to expensive. I’ve a fondness for New Zealand sauvignon and have tried, and liked, all of the big names over the last couple of years, including Isabel, Dog Point and Cloudy Bay. 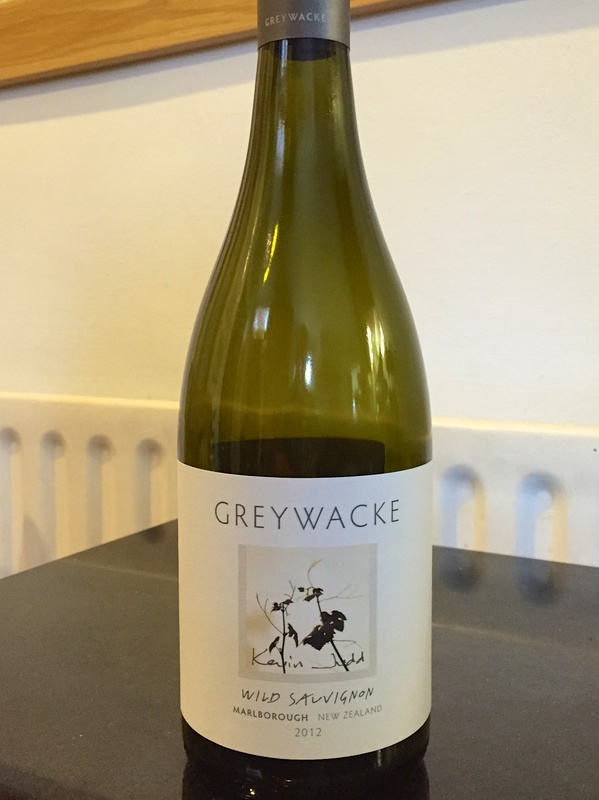 But my favourite is Greywacke (prounced greywacky, which I always think is odd) Wild Sauvignon, aged in old oak and fermented with wild yeasts. This is the 2012 from the WS at £23. Unlike many sauvignons some maturity helps here. A complex smoky nose which always reminds me of grapefruit, not typically sauvignon, lots of acidity but also very savoury. Great as an aperitif or, as we drank it, with roast chicken.